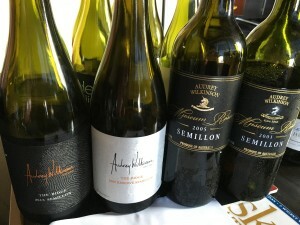 Recently SF Wine Center hosted a private Australian wine seminar focused on Semillon. 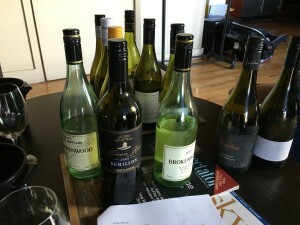 This grape is traditionally found in Bordeaux, blended with the dominant Sauvignon Blanc, but Australia has established Semillon as an interesting varietal wine that is bright and ageable. With producers like Tyrrell’s, Thomas Wines and Audrey Wilkinson, we sampled Semillon from 2015, 2009, 2005 and some older. The 2015’s, from the vintage down under earlier this year, were super fresh with a lot of lime, some tropical notes and ample acidity. The acidity was the most surprising element as I tasted through the older wines, permeating each wine and contributing to their freshness and longevity. The Audrey Wilkinson line-up was most impressive to me, with the freshness of the 2015 transitioning to the funky petrol and barnyard nose of the 2009 Reserve. I had forgotten that aged Semillon took on a petrol quality like Riesling; there was even some sherbet and talc on this one. The 2005 was toasty and complex, and the 2001 still had good acid and petrol, but I didn’t enjoy it as much as the 2005. Most of these wines are not widely available in the U.S., but if I happen to see an older Semillon on a wine list or in a wine shop I will be sure to give it a try.